PARAMUS — Matt Albanese is an artist who was a heroin addict for seven years when was arrested in Bergen County last year. Instead of just being charged with a crime and processed through the court system, as police would normally do with any person arrested on drug charges, authorities did something different. They offered him treatment. “When I was arrested I was at my lowest point. I was praying I wouldn’t wake up. I didn’t want to die but I was praying I wouldn’t wake up because I lost everything, basically," Albanese said Wednesday during an event announcing results of Operation Helping Hand — the program that he benefited from last year and that continued this year. “A year ago I came here in handcuffs, and now I work here,” he said, as the crowd at New Bridge Medical Center broke into applause. He said the program has given him a chance to get his life back. As drug overdose deaths continue to rise — hundreds every month in New Jersey — state Attorney General Gurbir Grewal said the success of the program in five counties means it should be expanded throughout the state. Operation Helping Hand involved arresting individuals buying heroin and other narcotics at open-air drug markets in Bergen, Morris, Passaic, Sussex and Union counties from June 11 to 15. Those taken into custody were met by recovery specialists at police stations and were offered help to get into detox. 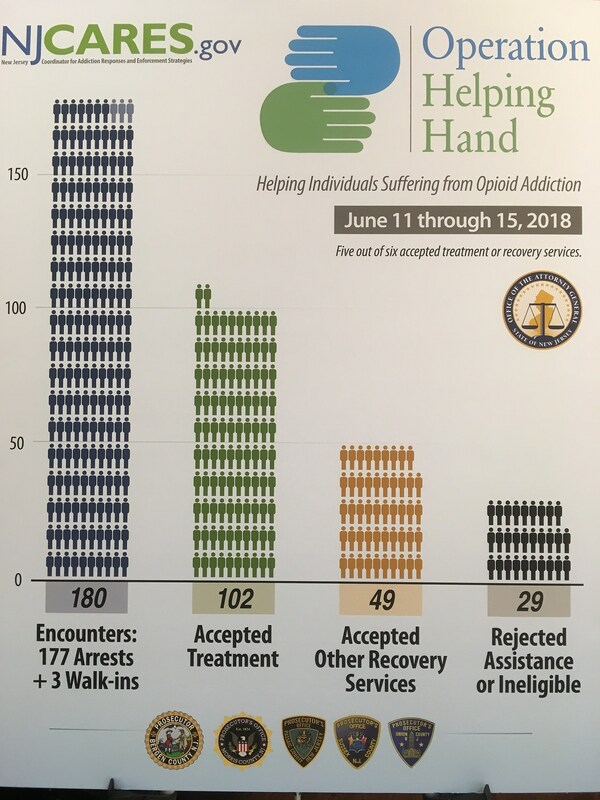 “Out of 177 individuals arrested in this five-county effort over the course of that week, a total of 148 accepted the treatment option or recovery support services,” said Grewal. Union County had three walk-ins —drug users who heard what was going on and showed up to ask if they could enter treatment and they were accepted into the program. Grewal said he truly hopes law enforcement officials from across the country use the Operation Helping Hand program as a model for how we can attack the opioid addiction epidemic. Grewal said Operation Helping Hand is important because of the continued rise in opioid deaths in New Jersey over the past few years. There were 623 heroin deaths in New Jersey in the first six months of 2017, up from 594 heroin deaths in the first half of 2016, and 415 heroin deaths in the first half of 2015. That represents a 50 percent increase between 2015 and 2017. The rise in overdose deaths involving fentanyl was even more dramatic, with 668 fentanyl deaths in New Jersey in the first six months of 2017, nearly double the 337 fentanyl deaths recorded for the same period in 2016, and well over four times the 150 fentanyl deaths recorded in the first half of 2015.